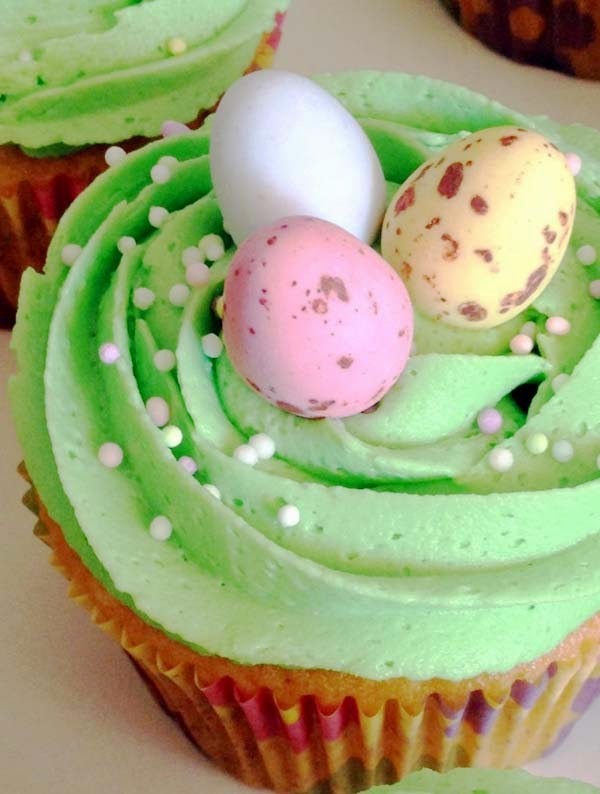 Cupcakes are a fun way to greet the spring season. 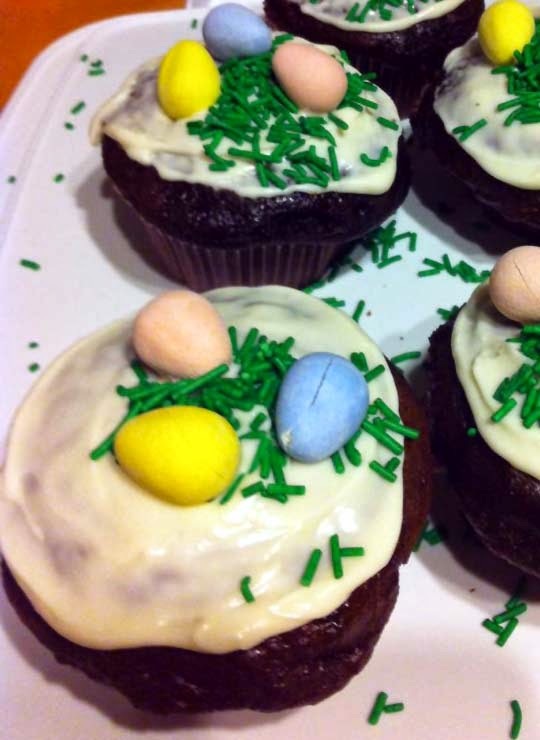 We usually have an event in church for Easter and a few of us bring food for fundraising. The past few years, I and other members bring cupcakes. As always, the fun part for me is baking and decorating them. There are some choices to make when it comes to cucpakes. The first one is on the cupcake itself. Do you make a chocolate cupcake, vanilla, pumpkin, red velvet, or some other flavor? I find vanilla to be a good all purpose cupcake. Chocolate is another. I just figure that you can't go wrong with them. And they are commonly available off-the-shelf if I don't have time to bake from scratch. Here's a recipe for a good vanilla cupcake from BrownEyedBaker.com. The recipe is good for making 12 cupcakes. Just adjust them measures to make more. 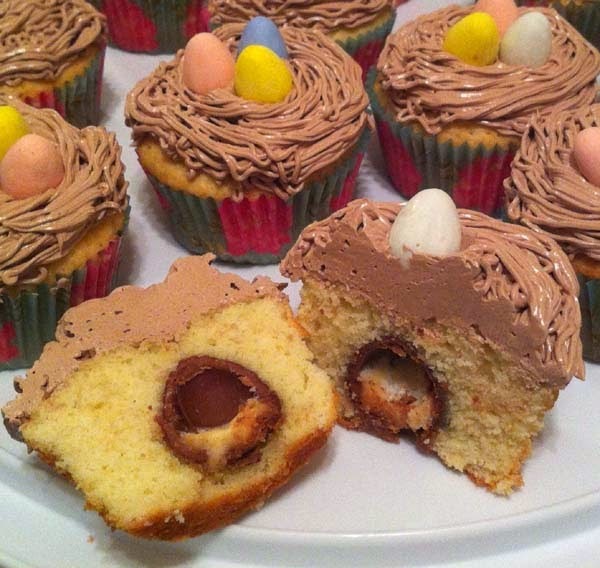 Additionally, after the batter has been poured into the molds, a mini Cadbury cream egg is dropped before baking. For the frosting, a chocolate Swiss meringue buttercream recipe is used from thebakerbecky.blogspot.com. 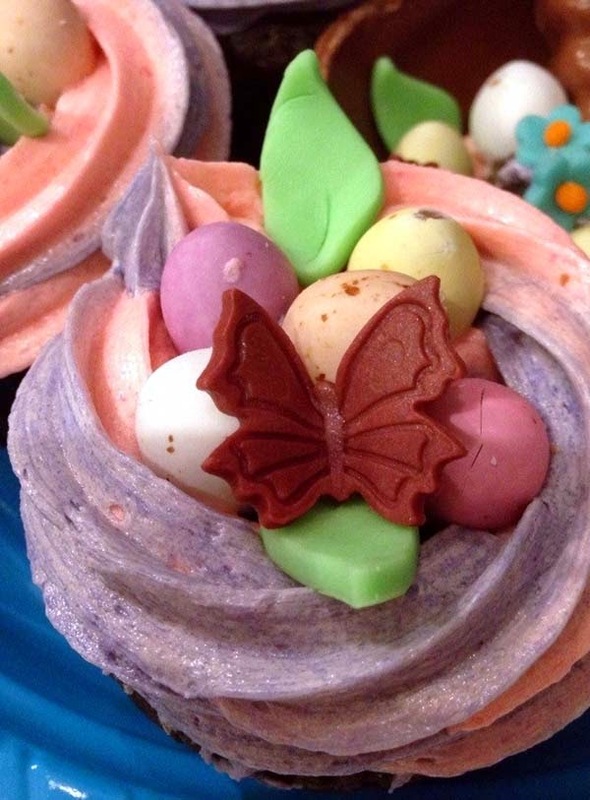 To decorate spring / Easter cupcakes, be sure to have plenty of Cadbury mini-eggs available. You can never have too much of those around. Also, grass / hair piping nozzles are handy for frosting. Make your decoration as colorful and unique as possible. Plain decors are nice, too, so long as the colors and spirit of spring are represented. 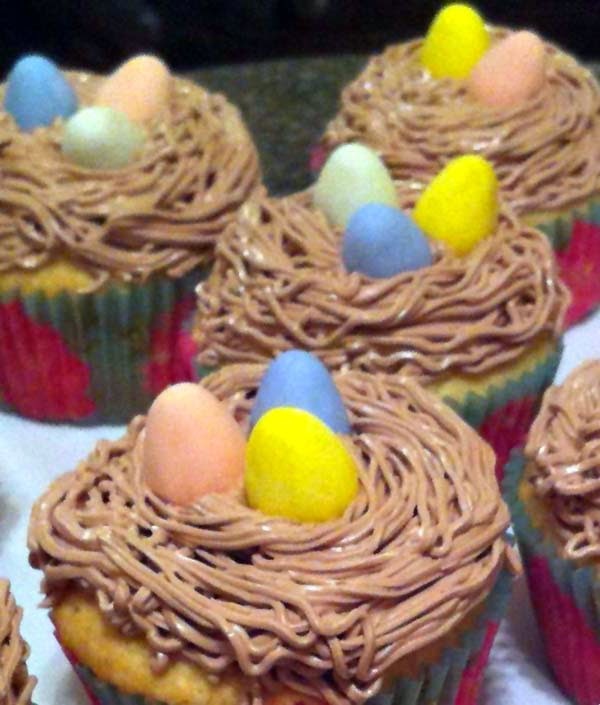 For example, the chocolate cupcakes below have been frosted with vanilla buttercream icing. Only a spoon is used to apply the frosting. The batch of vanilla cupcakes below have been decorated using a fairly common piping nozzle like these ones. 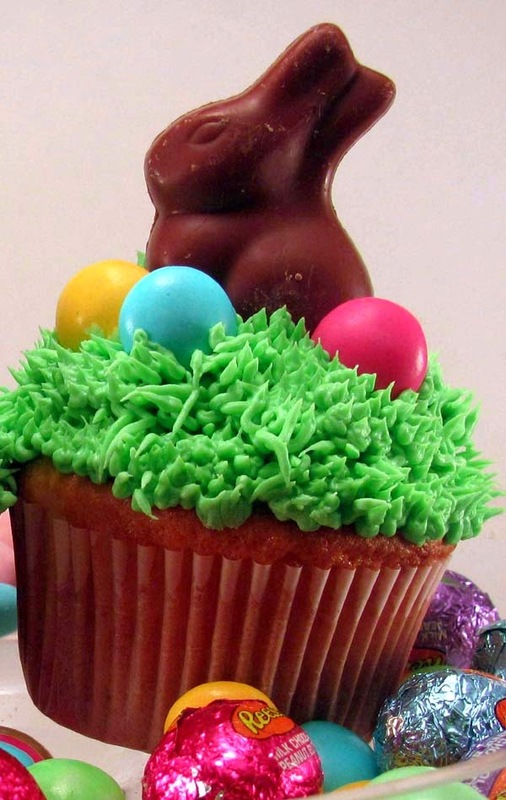 Besides Cadbury eggs, chocolate bunnies are also popular for cupcake decoration. Flowers and butterflies also make great decoration. You can even set up a whole scene. 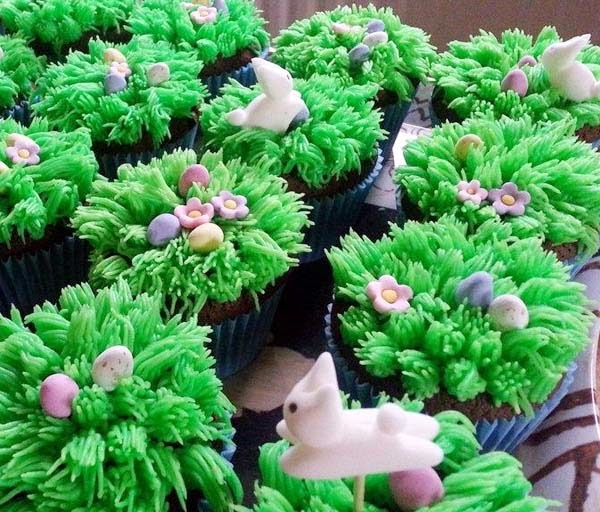 One of the church members decorated her cupcakes using a grass nozzle piping. She placed sugar bunnies as well. From certain angles, the rabbits look as if they're frolicking in the meadows.